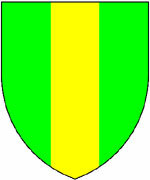 Any design on a shield is known as a charge. A charge can be placed on another charge, and a charge that has another charge on it is called charged. Charges are divided into two main groups, the ordinaries, and the common charges. When specifying the colours or tinctures for these divisions it is normal to state the top most (in the case of Barry) or the left most (in the case of Paly and Bendy) first. 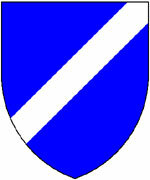 Ordinaries are basic geometrical shapes that are placed on the shield. There are several ordinaries that are concidered to be the orginal designs used in heraldry and these are known as the Honourable Ordinaries. 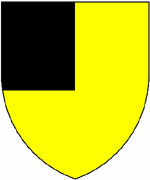 The following section shows the ten honourable ordinary shapes along with their names and an example of the blazon (the text that describes the shield). 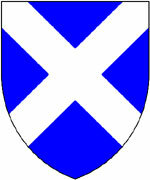 The pale is centred and is one third of the width of the shield. 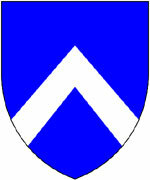 The fess is centred and one third of the height of the shield. The chief covers the top one third of the shield. 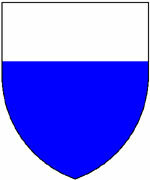 The cross is one fifth of the width and height of the shield. 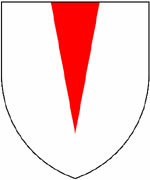 The bend and bend sinister are normally one fifth the width of the shield or a third of the width when they have charges on them. The saltire is a combination of Bend and Bend Sinister and is used on the Scottish flag. 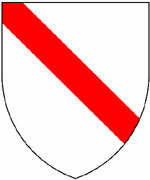 The cheveron is about a fifth of the width of the shield. The pile normally starts from the top of the shield and ends in a point near the base. 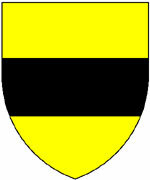 Usually a third of the width of the shield at the top. 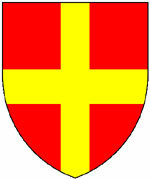 The quarter is usually placed in the left top of the shield (dexter chief) but can be placed top right (sinister) if described so. You can choose to add one of the additional divisions shown above to your shield. These can be found on the 'Set Field Division' popup. At the bottom of the popup is a 'More' button that will give you these extra division styles. To view the interactive shield designer you need to install Microsoft Silverlight. Please click on the link below to install Silverlight from the Microsoft website.